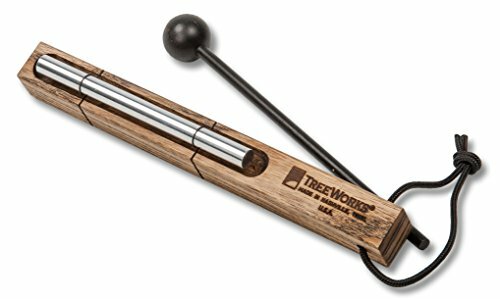 THE PERFECT TOOL FOR MEDITATION AND THE CLASSROOM | With just a strike of the mallet, the TreeWorks Chimes Single Tone Energy Chime produces a brilliant and lasting tone that fills the room with a swirling resonance. Use it as a way to recenter yourself throughout the day or as a way of signaling the beginning or end of a class session. No matter how you use it, you'll be surrounded by a crystal clear tone that puts you at ease all day long. PROUDLY MADE IN THE USA | Each TreeWorks Chimes product is made from Tennessee hardwood and locally sourced aluminum/titanium and is assembled in our workshop just north of Nashville, TN. COMPACT, VERSATILE, AND DURABLE | Long-lasting braided CordLoc is used to susped our 3/8" thick Aluminum/Titatnium alloy bars on a hand-finished hardwood mantle. Each Single Tone Energy Chime is fitted with a super-durable braided nylon cord handle for hanging. DIMENSIONS | The TRE410 is 13 x 1.5 x 4 inches in dimension and comes with one 8" birch dowel hard polymer mallet for playing. View More In Band & Orchestra. If you have any questions about this product by TreeWorks Chimes, contact us by completing and submitting the form below. If you are looking for a specif part number, please include it with your message.